Whether you are a beginner, a slightly nervous skipper when confronted with tight spaces in the marina or an experienced skipper who would just like to learn a little more, we have something designed especially for you. For beginners we would recommend the full Day Skipper course, you will be amazed at how much you learn in just 5 days. A course for aspiring skippers with some yachting experience and basic navigation and sailing skills. Learn to skipper a short passage with the instructor on hand to give advice and encouragement and ensure your safety. Experience being in charge, taking credit when it all goes well and being responsible when it doesn't. To view on the RYA site please click here. If you would like to either train or be tested for the ICC, or just need more information about the ICC please follow this link. Most skippers can manage to get their boat safely out of their berth, they then thread their way through the other boats in the marina and breath a huge sigh of relief when they get out to sea. They, and the family, then enjoy a trip along the coast before anchoring for lunch. The children and friends swim, lunch is made and everyone seems to be enjoying themselves but already the skipper can start to worry about getting safely back into the berth at the end of the day. If he or she is not confident in their ability to get the boat parked in a busy marina it can create an unpleasant and stressful atmosphere on board. This small but important detail can easily ruin an otherwise idyllic day out. By setting a day aside and investing a relatively small amount of money we will demonstrate and teach the techniques and methods used to perfect this difficult manoeuvre. Without a doubt this training will change and enhance the overall enjoyment of boat ownership. For just €300.00 we will spend a full day on your boat helping you to achieve calm and professional handling in the marina. Thinking about taking the Yachtmaster exam? There is no specific RYA course which prepares you for the exam which leads to this prestigious qualification, therefore we look at your strengths and bring your overall performance to the highest level possible. An in depth knowledge of all parts of the RYA Yachtmaster theory is essential before you take the exam, we can help fill in the gaps. Every YM preparation course will be different, we pride ourselves in achieving a pass rate in excess of 90% and over the 5 days leading up to the exam we will take you through all aspects that will be covered during the exam. The examiner wants to see you demonstrate a deep knowledge of both practical and theoretical skills, he also wants your crew to be enjoying themselves and for you to be managing them in a friendly and constructive way. On a motor boat the exam lasts 6-8 hours, a sailing boat from 8-10 hours. Duration:5 days or 40 hours, plus approximately 1 day or 8 hours of theory. The theory will concentrate on integrated navigation i.e. using both charts & plotters. If the client has completed an RYA theory course recently it may be possible to decrease the course duration by one day, this reduction in time will be at our discretion and will involve a short test prior to the booking being confirmed. Acceptable in many countries worldwide as proof of the skipper’s competence, the Day Skipper certificate is also accepted as a licence by both the Portuguese and Spanish maritime authorities. It is an official looking photo card document with the details sealed in a laminated pouch. The certificate is issued and registered at the end of the course; this means that the client can immediately use their boat. 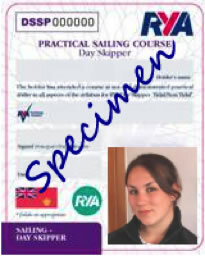 Using a copy of their Day Skipper certificate the client can apply for an ICC. Valid for use on boats up to 24 metres or 78ft. It is possible to obtain a commercial endorsement on this certificate. Not restricted by limits on distances from ports or marinas but clients must be aware of their own limitations and the suggestion is that it should be used in familiar waters. Like the Day Skipper course, this course consists of skippered passages in a variety of situations. Each trainee will skipper more challenging passages and learn more about passage planning, pilotage by day and night, boat handling, safety and emergency situations. To view on the RYA site please click here.